This entry was posted in Kindle Economics, Kindle Problems, Kindle Reaction, Kindle Review and tagged Kindle Sales, record sales, unicode, WiFi by Dzmitry. Bookmark the permalink. Nice job! Articles like this that are researched, well-written, and consumer-friendly keep me coming back for more! Great job! I am a previous owner of a Kindle1 and while that device had some issues, I noticed even then that many of the negative comments were from non-Kindle owners. I still don’t get why some try and compare it with the iPad either. I’m very interested in hearing what your tests reveal concerning the Kindle and foreign characters, particular Korean. This would be a nice selling point, particularly if Korean books could be downloaded on the Kindle. Nice review. I have a Kindle 2 which I love, and I got a 3 for my wife. It arrived on Friday and the screen was non functional. However with a couple quick calls to Amazon, this was quickly resolved, and they overnighted me a new one. It works great, and is a sold device. I prefer the old page turn buttons, and the new navigation just will take getting used to. I would still highly recommend the device, and with the new size, it is a solid upgrade of an already great product. I really hope they continue to update the Kindle 2 and being some of the new features to that device. I think that many of the new owners of the K3 were owners of the K1 who did not upgrade to the K2. I am one of those people. I managed to avoid upgrading to the K2 because in spite of the fact that it offered collections and smaller size I could not justify spending that much money again to replace an item that was still working fantastically. When the K3 was announced at the lower price and with the graphite color, I jumped. My K1 is still working and my hubby will enjoy using it. I am so glad that I got a K3 though. I really like the smaller size, the color choice, the collections, etc., etc. Couldn’t be happier with my decision to wait for the K3, and absolutely love it! I have a Kindle 1 and thought I would replace it with the 3. I still use the older kindle and it still works well. 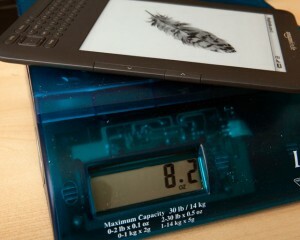 I just love the contrasting quality of the screen with the warmer shade of grey and the darker fonts on the new kindle 3. I like the ability to choose speech to text however I am not fond of the male voice. I like the smaller page turning buttons but the first kindle had quiet page turners and these click softly. The charge lasts a long while so far and I do have an iPad and iPhone that I also use for these books but the Kindle is the only one that works in the sunlight so all these devices are necessary. I’d really like to have a device that had the ability to work in night lighting that would be backlit like the iPad but also have the daylight screen like the kindle and the ability to switch back and forth. This is a great device for now and the price is so perfect that it seems everyone could own one! I like the way I can hold it with more finger space between control buttons too. Very nicely designed. 5 stars from me!!!! I bought a Kindle 1 as soon as I could get one after the initial 4 hour sell off and out of stock. Since I had not seen one before, it took me all of 2 hours of the 30 day trial to decide to keep it. I upgraded at the full price to the Kindle 2 within 2 weeks of its release as well. I didn’t even hesitate when I saw what the Kindle 3 was going to be and got in on the first shipment, receiving mine this Friday. My only comments different from those I have seen so far are that the power switch on the bottom needs to be stiffened up, I have knocked it into sleep mode a couple of times by resting it upright on my lap. The 5 way is way too close to the back button, sending me back when I was trying to cursor down. I solved this by using my thumb nail instead of my thumb. I am disappointed that they did not fix the sticky key function on the first letter of a note and they did not make the timeout variable or even 20 minutes like the DX. Finally I find it harder to use with one hand, but once I get it held right then it works OK so that is just a matter of training. Use the knuckle instead of the fingertip. On the positive side, it is noticeably faster. PDF files are actually useable now and were not on my Kindle 2. Lots of advantages of having the wi-fi running when using it. Bigger battery and much longer life. I am in an EDGE area, so really appreciate that the 3G gets cut off when connected automatically with the Wi-Fi. Also the Wi-Fi is way faster, as expected. I also like that it comes without a case so I may select the case of my choice and not necessarily that which Amazon has decided I need. My Kindle 1 is bare and I have 2 cases for it. My Kindle 3 is bare and I have no cases for it yet, though I may get one. I am leaning toward a slip case to protect it while out of the house. I don’t want the one from Amazon with the light that doubles the weight. That, of course, is a user choice. A small thing, but I also like that I can read with the lines left justified only. The Kindle 1 had that but the Kindle 2 did not. I thought I would be totally dissatisfied with the missing number row and the slash missing off the keyboard. After using it for a while, it is not as bad as I expected and I no longer hit a number when I wanted a letter. My ratings of the keyboards are K1 best, K3 second and finally the K2 as far as ease of typing on it go. I may follow the teenie bopper crowd and use periods instead of slashes for dates and phone numbers. I memorized that the T key is the Alt-5 key, so the numbers are easy to get to using the Alt+letter without having to count across the keys. I didn’t expect the Kindle 3 to be perfect for me, but it is well within my satisfaction level. I will keep it. I am a happy camper. As you can see from the fact that this is my third Kindle that I am happy with Amazon in general and the Kindle in particular. I was looking forward to getting an iPad, but have changed my mind at least for the immediate future. Maybe an iPod Touch if they add the camera. I really do love it, but I was one of the unlucky ones to receive a broken one. After doing some research it seems there was a batch with loose pieces inside of the kindle that could get in the way of keys and the power switch. You can hear them rattle back and forth whenever you move the kindle. @Author: I really want a Kindle, but I have some doubts.1) I want this device but I want to own the book. I want to be able to use it in the laptop, notebook, smartphone, Tv, Ipad, Nook, Sony, Ipod, etc. the same goes to the other companies. I dont want to have to buy the book again if I will decide to buy another ereader later. I want to have it with me, not in the cloud. 2) I want to be able to read anything that I want in the Ereader, my PDF, My documents, etc. 3) This need Epub support. This are my reasons why I do not have a Kindle yet. If they add this 3 other features to the Kindle than it would be complete: 4)Color. They need color badly if they want to enter in the newspaper, magazines, comics, Textbooks world. 5)Touchscreen. This is a must. we need to be able to write notes and highlight the screen with a stylus or something.6)Animation. A short animation clips could help with newspapers, magazines,comics, textbooks, and even traditional books including audio, can you imagine the possibilities. 7)Video. (Not necessary) 8)Internet. (Not Necessary) 9)Games. (Not Necessary) 10)Updating. It would be a nice feature if could be able to update our books with the new version for half the price we bought the old version. 11) Lower Prices. I don’t understand why these ebooks are not cheaper because They eliminate the cost of the process to convert trees into paper, Shipping, printing, copies, stocking, etc. And all the people in between of that process. 12)Backlit (Not necessary).